Orlando, FL – Searching for a slumpbuster, asking for a friend. It’s been some hard times as of late for the boys in purple. Orlando City entered tonight’s game riding a nine-game losing streak dating back to May the 13th. The Lions have had no luck scoring during this bad run of form, so how does one end such a horrible slump like this? Well, when you’re in a slump, you need an easy score to get your confidence back up. That’s where defending MLS Cup champion Toronto FC comes in. The champs have been even worse overall this season. 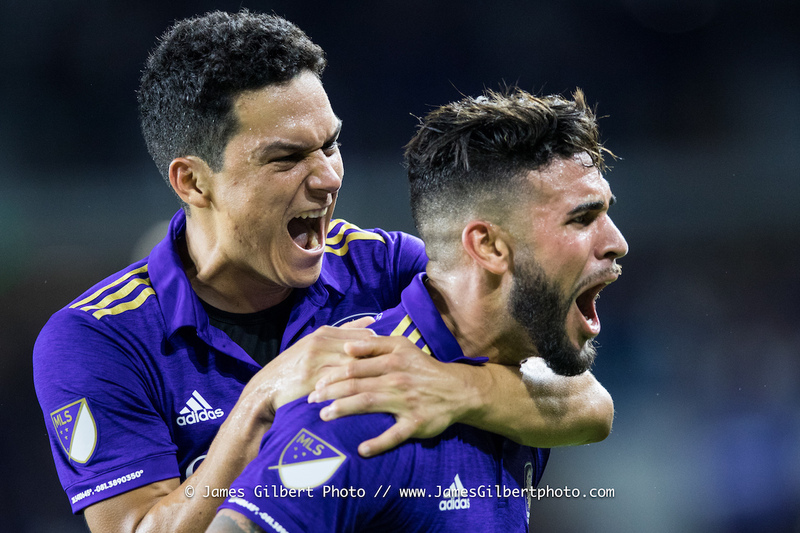 They have not won a game since June 8th, and are even further back in the standings, so tonight was the perfect pairing for Orlando to finally get the three points they so desperately needed. In James O’Connor’s first home match as head coach, Orlando City SC (7-11-1, 22 points) defeated the defending MLS Cup champions Toronto FC (4-11-4, 16 points) 2-1 on Saturday at Orlando City Stadium. Goalkeeper Earl Edwards, Jr. earned his first MLS win, as Chris Schuler and Dom Dwyer scored. The night also marked the first time since prior to the World Cup that OC was able to play at full strength with the return of Amro Tarek and Yoshimar Yotun. The Lions started the scoring in the 34th minute when Dwyer ripped a shot from distance that Toronto goalkeeper Alex Bono couldn’t handle. The rebound popped out to Schuler, who calmly headed into the back of the net. It was Schuler’s first goal as a Lion. Dominic Dwyer added a second goal in the 48th minute with a left-footed laser. His eighth goal of the season. Toronto was able to get one back late with Sebastian Giovinco feeding Nick Hagglund in the 94th minute to ruin Orlando’s shutout, but not the win. Slump busted.